Candles create a warm, magical glow. From paper bag lanterns to jelly jars, you can put your candles in a variety of fun and unique holders. Place them around your house or in your garden for a romantic and cozy ambiance. For a dramatic centerpiece at a party or wedding, create stamped glass candle holders. Using frosted glass candle holders, take a rubber stamp in a decorative pattern and dip into white paint. Press firmly on the holder and roll from side to side. Repeat the motif for a pattern covering the holder. For a custom design, visit a stationery store and have your stamp custom-made for you. Believe it or not, you can use fruit as a candleholder. Lemons and limes, as well as tangerines and oranges, work well with tealights. Simply hollow out the middle of the fruit and place the light inside. Use these as a centerpiece for a garden party or outdoor dinner. Place them in the foyer on an accent table for an inviting welcome. Once the light has warmed up, the scent of the fruit will permeate your room. Create paper lanterns and place them along a garden walkway or in your garden. 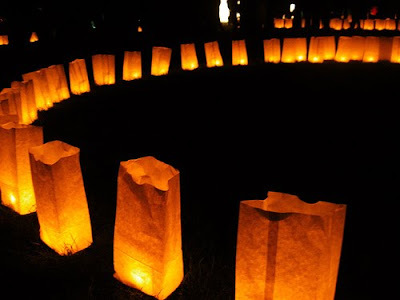 To create these luminaries, fit two paper bags, one over the other, to form a box lantern. Cut a hole in the bottom of the bag and place one small candle light inside. The glow from the light will light up the bag and create a beautiful luminary. For an added design, try covering the inside of each bag with doilies, that when lit, will look like warm lace. A mirror centerpiece topped with votive candles and tealights will create a beautiful addition to your table. Top each mirror with candles in glass votive holders. For color, sprinkle rose petals around the candles, which will smell delightful. When lit, the glow from the mirror and candles will reflect shimmering light onto your table. If you have wood around your house, try this as a candleholder. Drill a hole large enough to fit the candle inside. If the wood is flat long enough, drill 4 or 5 holes for a rustic centerpiece. Use it in your fireplace in the summer for a warm glow. A functional kitchen is essential for those who love to cook. When deciding upon which layout works best for you, consider how much space you have to work with and your design preference. Dining rooms can be tricky to configure but are easy to change, so you have more freedom in decorating this room. If you don’t have a lot of space but like the feel of an open kitchen, it's best not to add an island. Islands work well in larger L-shaped kitchens where the space is open to a family room. In smaller spaces, try to keep clutter to a minimum. Keep the stove, refrigerator and sink within 6 feet of one another. This is known as the kitchen triangle; the fewer feet you have between the three main areas, the easier it is to navigate. The size of the dining room is the biggest variable that affects its arrangement. If you have a large space, center the dining room table in the room, preferably below the main light fixture. This allows you space around the table and walls for your accessories and other pieces. Place a hutch, which holds dining room essentials like napkins and plates, in a corner of the room. On the opposite wall, if you have adequate space, try two large mirrors hanging side by side on the wall. Mirrors open up spaces and create ambiance in rooms where you gather. If you don’t have a formal dining room, but instead an eat-in kitchen, consider built-in benches on one of the walls. Benches don’t take up a lot of space under windows and can provide extra storage. Placing your dining room table opposite the bench makes an attractive arrangement. Adding accessories such as bold light fixtures and mirrors can also create a dramatic statement. Some homes have breakfast nooks or other areas where you can set up a more informal dining space. This area is typically small but serves as the main eating area. A solution for this small space would be to build two rows of built-in seats with a table in the middle. This would provide a lot of seating as well as space for doing homework or weekend projects.